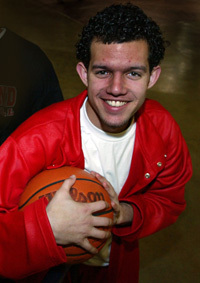 Taft High School legend Jordan Farmar enjoyed one of the most electric basketball seasons in the history of San Fernando Valley prep sports in 2004. Jordan led the Toreadors to the City Championship, the first time a Valley school had won the major division title since Granada Hills won the crown in 1964. In the City title game at the Sports Arena against Fairfax High, Jordan scored 29 points and made four clutch free throws in the final seconds to secure a 64-60 victory. In the State playoffs, the Taft point guard scored 38 points in consecutive games. In his senior year, Jordan averaged 27.5 points a game and put himself at the same level as probably the greatest basketball player in City Section history, UCLA All-American and Laker NBA Hall of Fame guard Gail Goodrich, who led Sun Valley Poly to the 1961 City title. At his senior season’s end, the 6-foot-2 Taft star had signed with UCLA. He was also named a McDonald’s All-American. As a taft junior, Jordan had games of 48 and 49 points en route to earning All-City honors. As a senior, he was selected the City Co-Player of the Year with his future UCLA teammate, Josh Ship, of Fairfax. Jordan won a World Championship Ring in 2009 with the Los Angeles Lakers of the NBA. In 2010 Jordan became the first of the High Award Winners to also become a Southern California Jewish Sports Hall of Fame inductee.